High jumper Nauraj Singh Randhawa is the flavour of the month but it is sad to see how he is being manipulated by some to promote themselves, their products or their companies. Ever since Nauraj qualified for the Rio Olympics after his winning effort of 2.29m in the Singapore Open, he has not only been bombarded with interview requests from the media but also sought by companies looking to ride his current popularity. There is nothing wrong in wanting to back an Olympic qualifier but the manner in which everyone is queuing up to exploit him is appalling. 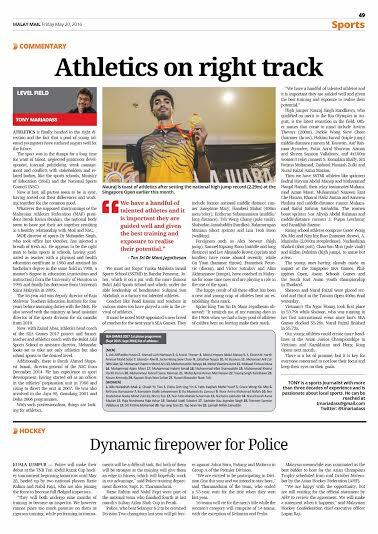 Companies and sports councils offering Nauraj a meagre RM2,000 and having the news highlighted in the press is certainly a cheap shot at marketing themselves. Nauraj should vet such invitations so that he is not taken advantage of but being new to the publicity circus, and being the ‘nice guy’ he is, he is probably obliging all of them. Maybe the Malaysian Athletic Federation (MAF) should take the lead in guiding the athlete and not jump on the bandwagon. Genuine support for Nauraj is welcome but it should be a contribution for the long term and not a one-off pittance, like the ones he has received so far. There were even efforts to get Nauraj to endorse equipment for a small payment but he was wise enough to decline. It is sad that many want to be associated with a sportsman when he makes the headlines but steer clear when genuine cases require assistance, especially in grassroots development. But then again, there are responsible corporations that emphasise sports development and come forward every time their help is sought even by the smallest club in the most remote of places, and they do it without any publicity. These are corporations that hold sports close to their heart and whose corporate social responsibilities are clearly defined. If there are organisations or individuals who wish to back Nauraj, for starters, they could help his father, Amarjit Singh, go to Rio de Janeiro to watch his son compete. Amarjit has not only been a source of inspiration for Nauraj but has also supported him fully with whatever means he had. The 56-year-old is currently unemployed and maybe assisting him in finding employment would be an act of kindness. After all, it is through the efforts of his parents, Amarjit and Manjit, that Nauraj has been able to do his nation proud. They were there to advise him when he contemplated quitting the sport after suffering a serious ankle injury, which required reconstruction of his ligaments, in 2011. Many athletes have been exploited in the past when they were in their prime or were up-and-coming. But once their form declined or they had served their purpose, they were dumped by their supporters like a hot potato. Just look at how many of our former sportsmen and women who brought honours to the nation have been forgotten. In their old age, many of them are struggling to make ends meet while some of them are unemployed. When double international (cycling and walking) Rosli Abdul Kadir’s plight – he was eking out a living washing cars – was highlighted two years ago, how much of assistance was he given? Unfortunately, Rosli died in a motorcycle accident early this week. Even when some of these icons start grassroots programmes to give back to their sport, they get little or no support. The National Athletes Welfare Foundation (Yakeb) is in place but whether it is doing enough is debatable. It is pointless to make contributions after an athlete dies. Medical insurance is available but this was recently reduced from RM5,000 per year to RM2,500 and conditions were added under which repayment for medication will only be made if it is obtained from a hospital. Many of our ex-athletes have expressed dissatisfaction at this state of affairs. Some do not even utilise the subsidy because they cannot purchase medicine from the pharmacies and medicine is expensive at the private hospitals. And at the general hospitals, the waiting time is just too long. Moreover, many of the athletes are old and some of them are immobile. Giving a little bit of aid when a member is in hospital and having the news splashed all over the newspapers is certainly unnecessary when Yakeb's primary function is to look after the ex-athletes. More often than not, this kind of publicity is embarrassing to the athlete on the hospital bed and certainly cheap publicity for Yakeb. Maybe, it is about time Yakeb working in collaboration with the National Sports Council should consider a pension scheme for ex-athletes? Yakeb’s new chairman Datuk Malek Noor, a former national bodybuilder, probably can look into making this body more relevant. When there is so much that can be done for our present and past athletes, it is sad that many pick and choose to whom and how much they want to contribute and in the process seek publicity at the expense of the athletes. Let’s treat our athletes with respect and dignity. Romance, excitement, upsets and giant killings feats are all trimmings of the FA Cup tournament and PKNS gave all of that en route to qualifying for the 2016 FA Cup final tomorrow against hot favourite and Malaysian football giant, Johor Darul Ta’zim. PKNS (Perbadanan Kemajuan Negeri Selangor or State Development Corporation of Selangor) will be the first club to attempt to win the FA Cup since the competition was inaugurated in 1990. Club-based football has been trying to make its mark on Malaysian football but has failed miserably thus far because in this country, it is all about state-based sentiments. Besides, several clubs that tried to break the monopoly of states were hampered by a lack of resources, especially monetary, to sustain themselves. Those clubs that have come on board are mainly employer-based and do well as long as there is support from management, but the moment there is a shift in top-level management or a change in company policy, the umbilical cord is severed. Among the big spenders that did well in the past but could not withstand the test of time are MPPJ (Malaysia Cup champion in 2004), Malacca Telekom, Public Bank, Negri Sembilan Chempaka, UPD-MyTeam FC, Plus and MK Land, to name but a few. Smaller clubs that folded after playing in the Premier League include Kuala Lumpur Malay Mail FC (2000-2002). 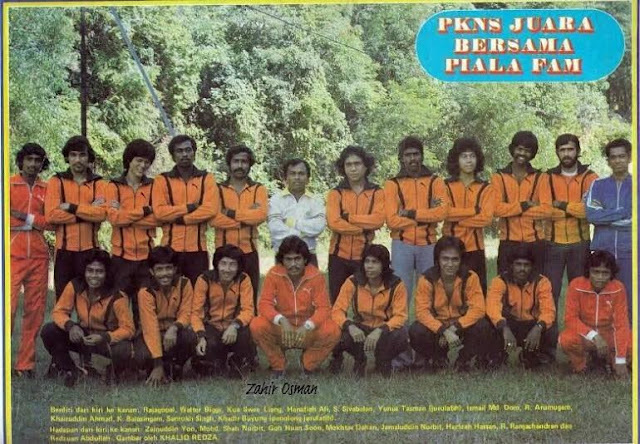 PKNS is one of the oldest clubs around, having been formed in 1967. From a powerhouse in the Selangor League, they went on to become one of the top clubs in FAM Cup, joint champions with Negri Sembilan Indians in 1978, winning it in 1979, and winning it again, in 2002. They were then admitted to the Premier League, where they remained for nine seasons before emerging the champion in 2011 and getting prompted to Super League. They won the Fair Play trophy in 2006 and were voted the Best Club in 2011. Other club teams in the Malaysian League are relatively newcomers as compared to PKNS in Felda United who are currently heading the Super League table and T-Team, while in the Premier League together with PKNS are DRB-Hicom, Uitm and Sime Darby. If PKNS, currently back in the Premier League, bag the FA Cup, they will be the first club to do so. Indeed, PKNS have a proud history as they have not only been a club for players to pursue their football career but also a place of employment. In the 1970s and 1980s, when professional football was an alien term, PKNS were already a "professional club" under the leadership of former Menteri Besar Datuk Seri Harun Idris, who was considered the godfather of Selangor football. The club excelled as top management prioritised sport. In fact, the late Mokhtar Dahari and R. Arumugam, Walter Biggs, Hanapiah Ali, Reduan Abdullah, brothers Shah Norbit and Zulkifli, Khadhir Buyong, Quah Swee Leong and K. Rajagobal played for PKNS. PKNS not only is big in football but the sports club also excel in many other sports like hockey, athletics, basketball and others. The club have their own facilities for sports activities in the form of the PKNS Sports Complex, which boasts two football fields. They are also big on football development with a Football Academy in place. Leading the club today is their first woman chairperson, Siti Zubaidah Abdul Jabar. Winning the FA Cup final will see PKNS earn a place in the AFC Cup next year, which alone should be enough incentive for the team to rise to the occasion and take the club to the next level – international. The odds may be stacked heavily against PKNS but the FA Cup is, after all, about upsets and could well see coach E. Elavarasan steer his team to victory. It may be a long shot but no other club deserves the impossible dream more than PKNS. Win or lose, the players would have done their club proud and should walk tall with their heads held high no matter what the outcome. PKNS would do club football a great favour if they won because that would underline the fact that club football is alive and can make the cut. And what better time for PKNS to stamp their authority and win more fans than now when "big brother" Selangor is facing turbulence after having been ousted out of the FA Cup and AFC Cup and still trying to find a firm footing in the M-League. The club have only ordered 10,000 tickets for their fan base but that could easily double if they captured the FA Cup and converted some of the Red Giants to Red Ants. PKNS’ mantra for the night should be "nothing is impossible". E. Elavarasan strives on handling low key teams and taking them to the next level. Come tomorrow, the 54-year-old coach will again be on the limelight take on when PKNS Johor Darul Ta’zim (JDT) in the FA Cup final.. The former Selangor defender who always likes to keep a low profile admits that his team has an uphill battle against JDT. 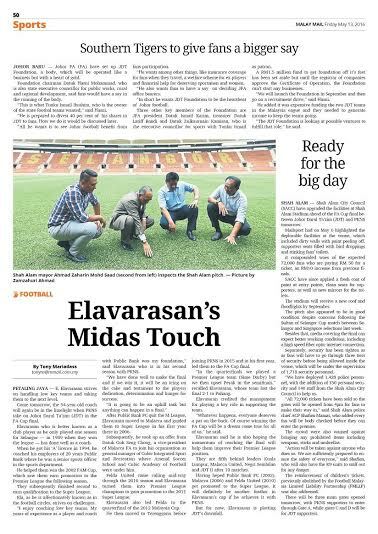 Elavarasan who was better known as a club player as he only played one season for Selangor – in 1989 when they won the League title – has done well as a coach. When he got his 'A' licence in 1994, he coached his employers for 20 years – Public Bank – where he was a senior sports officer in the sports department. He helped them win the 2002 FAM Cup, which saw them earn promotion to the Premier League the following season. They subsequently won the League to earn qualification to the Super League. Ela as he is affectionately known as in the football circles, strives on challenges. “I have enjoyed coaching low key teams. My years of experience as a player and coach with Public Bank was my foundation,” said Ela who is in his second season with PKNS. “We have done well to make the final and if we win it, it will be an icing to the cake and testament on the players dedication, determination and hunger for success. After Public Bank FC decided to quit the League, Ela had moved to coach Malacca and guided them to Super League in his first year there in first year in 2008. Subsequently he took the offer from Datuk Goh Seng Chong, the Vice President of Malacca FA to join his organization as the general manager of Cubic Integrated Sport and Recreation where both Arsenal Soccer School and Cubic Academy of Football were under him. Felda United came calling midway through the 2010 season after their coach, Reduan Abdullah, was suspended by the FAM. Elavasaran guided them to win the Premier League and gain promotion to the Super League for the 2011. Elavasaran also led Felda to the quarter final of the 2012 Malacca. He then moved to coach Terengganu before he joineing PKNS in 2015. In PKNS reaching the final, Ela said the luck of draw also played part in their progress. Ela also credited the management team for playing a key role in supporting the team. Ela said he is also hoping the momentum of reaching the final will help their Premier League position. They are currently fifth behind leaders Kuala Lumpur, Malacca United, Negri Sembilan and Johor DT 11 after 10 matches. Having guided Public Bank FC (2003), Malacca (2006) and Felda United (2010) gain promotion from the Premier League to the Super League, it will definitely be another feather in his cap if he achieves it with PKNS. But for now, Elavarasan is plotting JDT's downfall. Subramaniam Singaraveloo or better known as Mej (Rtd) S. Maniam returns to Malaysia to take up the Squash Racquets Association of Malaysia’s (SRAM) director of coaching post on July 1 after imparting his expertise in India for 14 years. The former Malaysian national squash champion, national coach, Director of Coaching and affectionately known “Mr Squash of Malaysia” is certainly the most decorated Asian squash personality having been inducted to the Asian Squash Federation in 2009 and besides his consultant coach position in India, he was also the Director of Coaching for the Asian Squash Federation (ASF) and is still the director of the World Squash Federation (WSF) coaching and development committee. He has conducted more than 200 coaching courses at various levels. The 62-year-old who will return to Malaysia on the third week on June was contacted by Mailsport’s TONY MARIADASS in Chennai and below he answers 10 questions…..
Mailsport: What made you return? 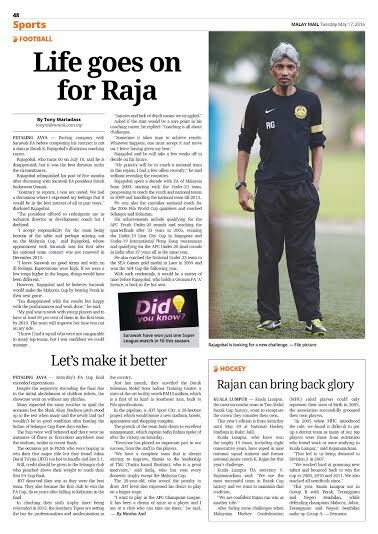 Mej Maniam: During his tenure as president of SRAM, Datuk Sani Karim invited me to return as Director of Coaching. But it did not work out at that time. The current president Huang Ying How then asked me sometime late last year. My contract with India was up for renewal in October 2016. I spoke with Mr N.Ramachandran, the patron of SRFI, expressing my desire to take up the Malaysian offer. After some discussions he reluctantly gave me his blessings. I had served Indian squash 14 years. My family were happy as they wanted me back. My two daughters had moved back a few years ago. My 17 years with SRAM was enjoyable and fruitful and I wanted to work with them again. Mailsport: Who played significant role in your squash journey? Mej Maniam: When I left in 2002 I had the blessings of two very important people in my squash career. Tan Sri Tunku Imran who was responsible for my coaching career and Tan Sri Mokhzani who was then the president of SRAM. In fact, Tan Sri Mokhzani wanted me back after a couple of years of my departure. I will never forget the support they provided throughout. 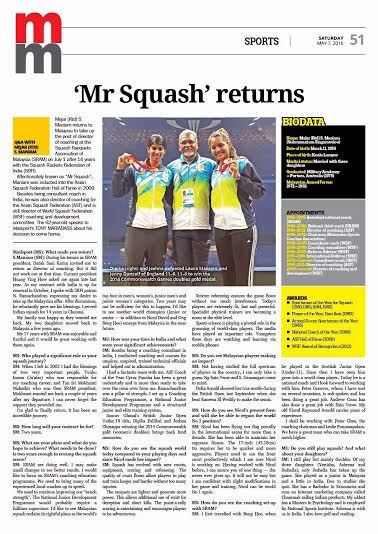 I am glad that I am finally returning to give back to squash in Malaysia. It has been an incredible journey for me. Mailsport: How long will your contract be for? Mailsport: What are your plans and what do you hope to achieve. What needs to be done? Is two years enough to revamp squash scene? MM: SRAM doing are well. I may make small changes to see better results. I would like to focus on SRAM’s coach education programme. We need to bring many of the experienced local coaches up to speed with the rest of the advanced countries in squash. We need to continue improving our ‘bench strength’. The National Junior Development Programme would probably require a full time supervisor. I’d like to see Malaysian squash take back its rightful place as the world’s top four in men’s, women’s, junior men and junior women. Two years may not be sufficient for this to happen. I’d like to see another world champion (junior or senior- in addition to Nicol and Ong Beng Hee) emerge from Malaysia in the near future. Mailsport: How was your tenure in India and what were your significant achievements? MM: Besides being a coaching consultant in India, I conducted coaching and umpires courses, umpired, trained technical officials and helped out in the administration. It was enjoyable and memorable tenure. I had a fantastic team with me. ASF Coach of the year Cyrus Poncha has been a great understudy and is more than ready to take the reins over from me. Mr. Ramachandran was a pillar of strength. He gave me a free hand to handle coaching. I set up a coach education programme, a National Junior development programme and a structured junior and elite training system. 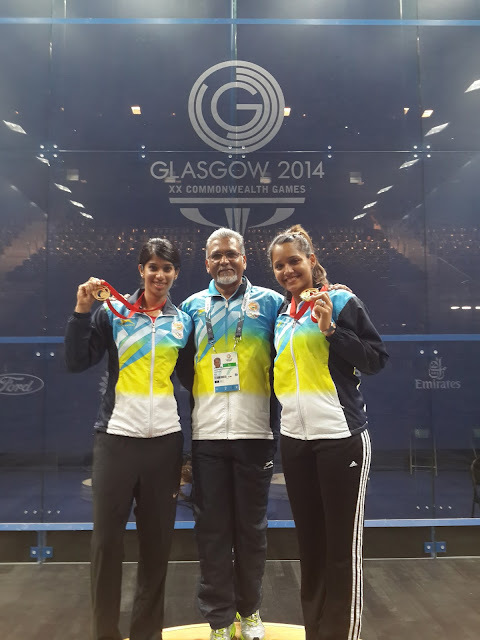 Saurav Ghosal’s British Junior Open U19 title, Asian Games Gold (men) and Dipika Pallkai and Joshna Chinappa winning the 2014 Commonwealth gold (women) brings fond memories. 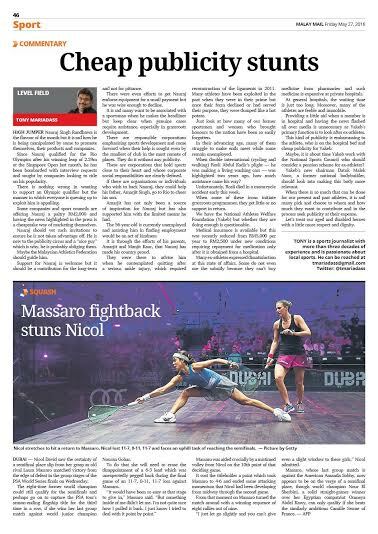 Mailsport: How do you see the squash world today compared to your playing days and since Nicol made her impact? MM : Squash has evolved with new courts, equipment, scoring and refereeing. The quality of the squash court floors allows players to play and train longer and harder without too many injuries caused by the hard floors of yesteryear. The rackets are lighter and generate more power. This allows additional use of wrist for deception and short kills. The point a rally scoring is entertaining and encourages players to be adventurous at the right time. Stricter refereeing ensures the game flows without too much interference. Today’s players are extremely fit, fast and powerful. Specialist physical trainers are becoming a norm at the elite level. Sports science is playing a pivotal role in the grooming of world class squash players. The media (print, digital and social) have played an important role. Budding youngsters, these days are watching and learning via their mobile phones. Mailsport: Do you see Malaysian players making an impact? MM: Not having studied the full spectrum of players in the country I can only guess. Ng Eain Yeow and Sivasangari come to mind. Delia Arnold showed her true mettle during the British Open in September 2015 where she beat Raneem El Weilily to make the semis. It was an outstanding performance. This only shows she has it in her to make top 10 at least. Need to look at her plans and take it from there. Mailsport: How do you see Nicol's present form and will she be able to regain the world No 1 position? Mailsport: How do you see the current coaching set-up with SRAM? MM: I first travelled with Ong Beng Hee, when he played in the Scottish Junior Open (Under-11). Since then I have seen him grow into a world class squash player. Now he is a national coach at SRAM and I look forward to working with him yet again. Peter Genever whom I have met on several occasions is soft spoken and has been doing a great job with all the players at SRAM. Andrew Cross has done a great job with Eain Yeow. My old friend Raymond Arnold carries years of experience. In the team I shall be working with Peter Chee, the coaching Chairman and Leslie Ponnampalam and I am really looking forward to it because I think we have a great team. Together as a team and with full support from Datuk Ahmad Shapawi (Ismail) from the National Sports Council, I think we can take SRAM a notch higher. Mailsport: Do you still play squash? What about your three daughters? MM: I still play squash but mainly doubles. Of my three daughters (Venisha Mani, Ashrena Mani and Jesheila Mani), only Jesheila the youngest took up the game. She played as a junior in Malaysia and a little in India. Due to studies she quit. She has a bachelors in economics and runs an Internet marketing company called Chammak selling Indian products. My oldest has a masters in psychology and is employed by Institute Sukan Negara (National Sports Institute). The middle one, Ash, is with us in India. I love golf and reading. 1999-2002 Chairman-Malaysian Sports Coaches Assoc. · Worked with players who became Commonwealth Games Women’s Doubles champions, Asian Games champions, World Junior men’s and women’s champions, British Junior Open champions and winners of several other international titles. · Created and implemented the Coach Education Programme for the Asian Squash Federation, Malaysia and India. · Initiated the WSF Coach Education Programme. · Lectured at the World Coaching and Development Conference (Malaysia, Brazil, Sweden, Poland) WSF AGM (KL, Austria, New Zealand, Philadelphia, Nice) and all coaching conferences in Asia.